All year, I have been training for a half marathon. My first, in fact. Not only that, my first long-distance running event since high school track, when the longest I ran was the 2-3 circles required to hurl a discus. Month after month, I logged the long miles for training. October loomed and the event drew ever closer. Day after day, I documented the ups and downs of my training, hoping to publish the gripping narrative on this.very.blog. Hell, I was even going to post the outcome — triumph or failure! But lo’, in the midst of training, I discovered that Hollywood was already on to me. Not only had they turned my experiences into a blockbuster movie, but also they had gone so far as to chronicle my experiences in a best-selling, award-winning, internationally acclaimed book that debuted before the movie! A short, over-aged, knock-kneed runner built like a tank and often mistaken for a cow pony instead of a Thoroughbred becomes an unlikely champion and inspires a nation down on its luck. How could that be about anyone but me??? “Air Equine” by carterse. Image CC. To cover their crafty, ruthless copyright-infringing tracks, Hollywood’s media moguls cast a racehorse named Seabiscuit in the lead role of my story, then they hired the mightily talented Laura Hillenbrand to dredge through fathoms of research woven into a compelling narrative detailing the true yet quirky and almost unbelievable events that propelled the Biscuit to stardom during the Great Depression. No other athlete at this time accumulated as much coverage across column inches in newspapers and magazines than the little Seabiscuit. And probably, no other athlete was as underestimated as this pokey plug! But outcomes rarely match our expectations. Mediocrity haunts the alleged greats, just as majesty lurks in the supposedly small. Coming to half marathons with virtually no prior experience and plagued throughout training by pernicious foot pain, I certainly underestimated my own outcomes. On nights I sat immobilized with my feet and legs elevated and wrapped in liniment-soaked bandages, I expected I would throw in the towel. Hang it up. Call off all the bets. But after a few days’ rest, I’d hammer on my shoes and hobble back out to conquer yet another chunk of the 13+ mile course. I strongly recommend reading Seabiscuit if you seek the inspiration to keep going against all odds. For pointers on how to persevere and achieve great outcomes despite being restrained under low expectations. Read it if you enjoy historical nonfiction. Read it if you’d like to know how my half marathon went, how I struggled with mud, heat, competitors, the prying eyes of paparazzi, and how I did on the biggest race day of all with everything on the line! It’s all there. Do be aware that the first couple of chapters are heavy with names, places, and details that, although accurate, do not come back into the narrative. Also, I feel obligated to warn you that the race scenes pitting the Biscuit against his arch rivals are so climactic, you are likely to tug for the next page with your teeth–fingers being too slow! And if you are pressed for time, may I suggest reading only Chapter 5, which will teach you more about the dangerous world of jockeying than you ever knew you wanted to know and now that you know you can’t believe no one ever bothered to tell you how friggin’ exciting it was and now you are giving everyone the silent treatment for their role in your misguided ignorance. Hillenbrand, Laura. Seabiscuit: An American Legend. New York: Random House, 2001. Print. Bérubé, Michael. The Secret Life of Stories: From Don Quixote to Potter, How Understanding Intellectual Disability Transforms the Way We Read. New York: NYUP, 2016. Print. Summary: Regardless of whether a book features a disabled person, says Bérubé, all literature on the whole is haunted with intellectual disability in some way. At times, disability sparks or corrupts motives, generating a more compelling plot. But for the cleverest of writers, intellectual disability illuminates and elevates the entire text by disabling the narrative in a way that makes more “abled” readers work hard to decode the the story while simultaneously gaining a better understanding of what it is like to have a disability. Critique: The title drew me in. Suckered, more like. Stories have a secret life? Just like bees??? And that secrecy has something to do with disability? Count me in as curious! Reading Bérubé’s touching introduction about his youngest son’s intellectual disability set me up to think the text that followed was going to be intellectual creative nonfiction à la E. O. Wilson. But unfortunately, the book reads like a PhD dissertation. Didactic scholarly tone. Long sentences that tie their own grammatical and syntactical Celtic knots. Plenty of phrases like, “within the wider discursive structure of relations among different levels of text….” More fun than the obfuscated tone is Bérubé’s way of spurring cat-fights among his colleagues–calling them out for shoddy research or inept theories. I was sure, at any moment, he was going to scwatch their widdle wesearching eyes out!!! That said, Bérubé still introduced me to a topic I very much much wanted to meet. (And I do thank him for an intelligent introduction, at that. I am now better informed than I was.) He provided many analytical ins where before I’d met locked doors. His example texts welcomed me into the conversation, even if his erudite style did not. Wein, Elizabeth. Code Name Verity. New York: Hyperion, 2012. Print. Summary: World War II historical fiction of the most gripping kind! Either the protagonist, Julie (AKA “Verity”) spills her guts about her spying exploits or her Gestapo torturers will…well, spill her guts for her! Critique: This book is an epistolary thriller (thought you’d never see that combo, right?) assembled from hotel stationary scraps, prescription cards, and any other pulpy item around that can be scrounged up. The more the pieces assemble Verity’s confessions, the deeper readers dig into her friendship with female pilot, Maddie. Eventually, readers discover that Maddie flew the plane that crashed landed Verity right into enemy hands. And just when the narrative reveals Maddie’s fate since the crash, readers lose contact with Verity! The motivations driving the characters are electrically urgent and starkly primal! The historical facts are cunningly deployed. The pace is a swift, cruel dive into constant unknowns and dangers. The pages might as well be coated in super glue — no way can you put this book down! Asma, Stephen T. On Monsters: An Unnatural History of Our Worst Fears. Oxford: Oxford UP, 2009. Print. Summary: If we be human, then need we monsters? In other words, is one of the defining characteristics of humanity the creation of monsters and the monstrous? After all, monsters have always been around. They lurk in our literature, religions, myths, imaginations, landscapes, histories, and (gasp) even in ourselves! Asma takes an omnivorous approach to this topic, exploring the evolution of monsters in relation to science, philosophy, art, literature, psychology, even popular culture. Asma also takes a long hard look at the evolution and mutation of heroes — those summoned to face and defeat what the rest of us fear. Critique: Why should men and babies worry about witches? Who was the greater monster-slayer: Charles Darwin or Alexander the Great? Why are we more afraid of female monsters? With innovative provocation, this book invites readers into the world’s most frightening realms to confront the most wondrous yet horrific aspects of human nature: the creating and killing of monsters. According to Asma, “Each era expresses different fascinations with monsters” but regardless of time, culture, or technology, key features of what makes a monster are consistent. And its these consistencies that wind up communicating a lot about how humans see the world, each other, their desires, their fears, their enemies, and their heroes. This is a terrific read for writers who deal in horror, the Gothic, paranormal, fantasy, maybe even political thrillers — any genre wherein monsters are made. And it should not be overlooked by anyone noticing the recent trend in Hollywood to create conflicted, sympathetic villains competing against dark and seedy heroes (or antiheroes). Think Iron Man, The Lizard, Bill the Butcher, Walter White, Batman, and Sherlock Holmes. Lately, the line between good and bad is a murky one to draw. And Asma’s research goes a long way helping us understand not just THAT this is happening, but WHY. Why we doubt who’s good, who’s bad, and who needs done away with. The word “monster” stems from Latin monstrum, rooted in monere, to warn. Monstrum can also be found in demonstration, which originally meant “proof that something is true.” So then, monsters are warnings and, perhaps, they are also flares of truth. Ignore your aversion to footnotes, citations, and source quotes. Asma is a good storyteller and precise researcher with a mind like a lantern able to lead you ever deeper into the dark. Hennessy, Jonathan. The Gettysburg Address: A Graphic Adaptation. Illus. Aaron McConnell. New York: William Morrow, 2013. Print. 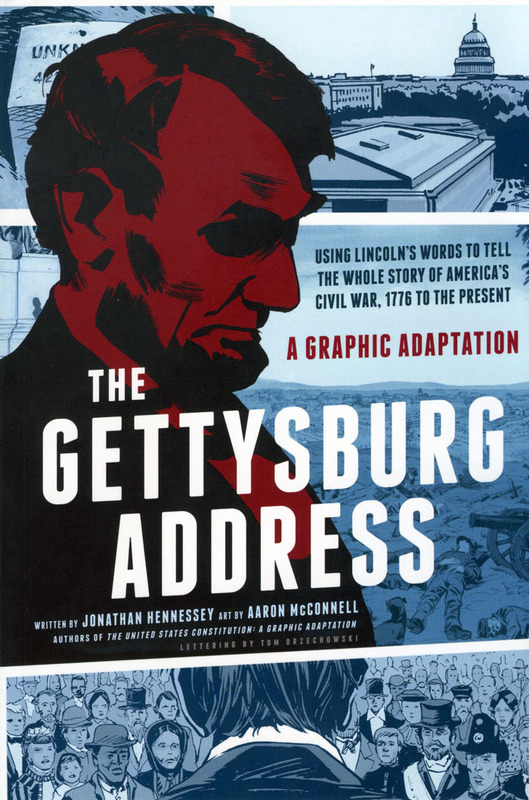 Summary: Hennessy and McConnell use the innovative and fast-moving format of the graphic novel mode to tell the story behind the Gettysburg Address, what prompted it, what it changed, and why it mattered to America and the world. Critique: The cover of this book claims to retell this moment of history through Lincoln’s words. I was immediately drawn in because Lincoln is one of the most eloquent writers e.v.e.r. I assumed from that cover claim that the graphic novel would rely only on Lincoln’s writings. It turns out that is not the case, but the book hardly suffers as a result. Hennessy’s script is excellently composed and draws on a ton of primary sources. The writing is clear, even when dealing with ideologically or philosophically tough stuff. And combined with McConnell’s excellent artwork, each page is densely loaded. But the arc is compelling, engaging, and hard to put down. The book opens like a movie with a series of live action scenes: a family returns to the war carnage on the front lawn of their home. Cut to: President Lincoln receiving word of the outcome of battle at Gettysburg. Then the narrative steps back and an omniscient narrator takes over. Acting like the voice-over in a film, this narrator begins to explain what is going on. The imagery takes on more of a mix-and-match composition. Sometimes a page might have as many as 9 panels, and each one is treated like an individual block of information, rather than one piece in a sequence of actions (which is what you usually get in graphic novels). Often the panels are briefly footnoted, informing the reader who or what is being depicted. Senator So-and-So from Tennessee 1865 or Governor Whatshisname from Maine 1848 or the Such-and-Such building. Structurally, the book takes what I call the rabbit hole approach. It establishes the “present” moment: the political climate, the historical context, what happened at Gettysburg and why Lincoln needed to make a speech there. Then, it dips down the rabbit hole of time and moves backwards, to that “four score and seven years ago” when the Founding Fathers were first conceptualizing a new form of democratic governance. Then it dips further down, or shifts further back, and back again, and back again, going all the way back to the conditions of North American continent post-dinosaurs. Then it walks the reader forwards again getting all the way to the Civil Rights movement of the 1960s. Hugely effective, efficient, and easy to follow. Given all the recent conflict between communities and policing authorities, this book made for a sobering, yet illuminating read for the mature and leveled way it navigated issues like abuses of power, authority over the masses, and more!